The weather here in San Francisco has been up and down lately, from low 50’s to mid 70’s. I have been taking FULL advantage of the warm weather moments, especially with my weekends. I have been checking out a bunch of spots in the Mission (neighborhood), near my new apartment. I just love a pretty monogram! I am so sad that C.Wonder has closed down. I absolutely loved the preppy style of their pieces. 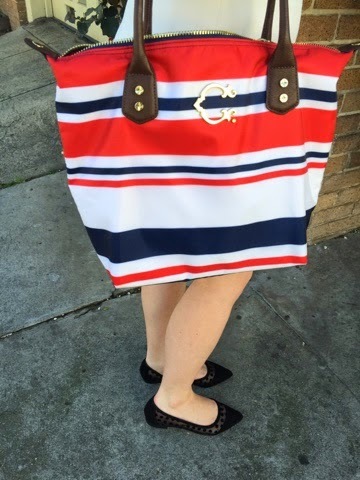 Thankfully, I still have a few C.Wonder styles that I continue to love, including this patriotic monogrammed nylon tote. I am so excited to be able to wear it throughout the Spring and Summer! I absolutely love my new Sole Society flats! They have cute little polka dot sides and are super comfy. If you are ever on the lookout for cute and comfy flats in a million different styles, then you should definitely check out Sole Society. I couldn’t wait to wear these out to Sunday brunch! Arg! I'm so jealous of your weather!! It's been snowy and sleety here in Virginia for the last week! That bag is SO CUTE too! 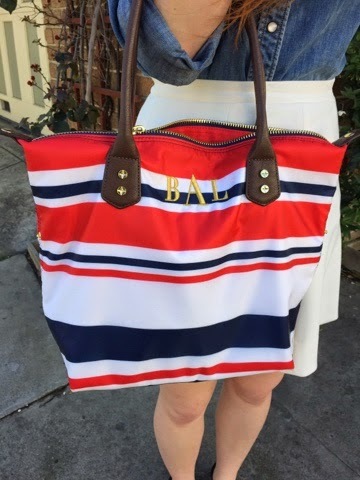 I'm obsessed with monograms and stripes! I host a weekly linkup over at http://www.2catsandchloe.com called Celebrate Southern on Monday nights. 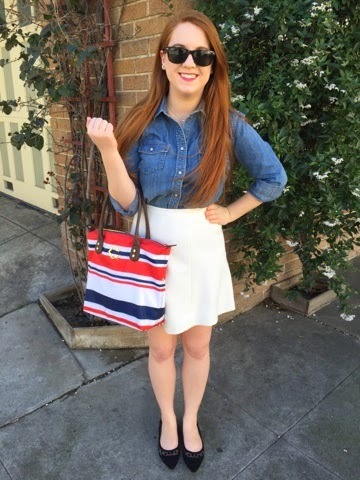 You don't have to be a southern blogger to join the fun – this post (monogram and all!) would be a perfect fit! With all the snow we are having here in Maryland it's great to see someone enjoying good weather. That bag is so cute too. It has been so warm in Utah this winter, too. Thanks for the inspiration to dress well and take advantage of it.